Check back for our 2018 coverage. 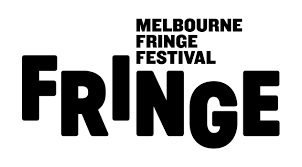 Welcome to our coverage of Melbourne Fringe Festival. This is our first time covering this Fringe and we’re doing a bit of reviewing this year. We’ve trawled the programme and pulled out some recommendations, across the genres, celebrating the diversity on offer at Melbourne Fringe. We’ll be adding more choices throughout the Fringe. Our visual way to find a show at Melbourne Fringe. We’ve chosen images from the Fringe programme that intrigue us and then selected from the shows you might want to see. Click on an image that draws you to find a show, then get booking. The thing that drew me to writing the Bacon show was combination of things. having been directed by one of the leading directors in solo show theatre. Gareth Armstrong in what turned out to be a controversial show about Jimmy Saville. BEFORE the revelations were entirely revealed. And NO there was trace of evidence on google or you tube. That was a baptism of fire but it set me up as a solo performer. The trigger was an approach from a couple in a cafe in Crystal Palace south London. A lady and her husband insisted that I looked like Francis Bacon. The impact of that observation lead me to go home research him, watch some youtube clips. I paced around my office at home tracing out the voice, some physical characteristics and so on…yes I thought I can do him…It is NEVER a good idea to do a character just because you look like him or her. Unless you want to make a fortunate out of look a like appearances. (That’s an idea?) So I book marked and templated a script idea in a couple of days and buggered off to Edinburgh to get a hard time playing Jimmy Saville. That by the way was idea I had had for over 20 years. But that’s another story?! What’s unique about it ? The unique thing about Pope Head is from the man and the artist himself. I am very proud to say more and more people from the audience and academic world are saying how good and indeed unique the script is. At first to me as an actor it was just a platform to work from a vehicle and from doing my first solo show I realise that audiences do accept and want new ideas. How has it evolved over time ? The play itself has evolved in subtle and dynamic ways. As I of course come to understand Bacon as a man, as an artist, as a human-being. The utter power of simply being yourself. My favourite development is the introduction of Blakey of On the Buses; who is now the police officer who arrests Bacon for possession of drugs …” You’ve made my day Bacon, you’ve made my day” I have added clarity to the story here and there and bloody made sure most of that is in the next print of published script! [Copyright 2014]. I have of course mastered what is a very intricate script and very complex one to learn and perform. It was confirmed by another very experienced writer and actor that learning your own scripts is far more difficult than learning some one else’s script. I don’t know why and neither does my colleague? I am lucky enough to have met several remaining friends of Bacon’s from several circles. Yes he had several circles of friends. All and I mean ALL have endorsed the play in very generous and humblings ways. But I don’t walk around with all of this in my head. I am far too busy working hard and trying to survive as an actor. But when I do interviews like this it is very powerful stuff to reflect upon. Are you too close to it ? I am not sure that I am too close to the play? I dont think so. But I admit I am obsessed by playing Bacon. Obsessed in respect of working the piece, working the character. Or is it working me? I can’t be curtain. What I am aware of is the enjoyment the audience gets from the play. Those who knew him, art historians, ordinary theatre goers looking for a new experience. I am very relaxed with the piece now. It is a joy to rock up tech the show and do it. That simple. What would an encounter between you and bacon look like ? If Bacon was alive I was told by a lady who knew him well. She came to see the show in London this summer. She said: “Oh, Francis would have loved it!” I am not sure how he would react to me. I do know that I would indicate that we both share similar philosophies here and there. But he was may more dangerous and out there than I. My major instinct for him was the sheer volume of courage and ambition the desire to achieve absolutely everything. He would see into me and may encourage me to do more or perhaps he may see something that separates us completely and I am left with my deft character acting skills. What keeps drawing you back to it ? I do think there is a danger that solo players can carry on with a show for unhealthy reasons afraid to let go or the fear of missing out. I have an aim for the art academic area. Glasgow School of Art really loved my interpretation. So going back to the unique element there are a number of elements that keep the life of Pope Head very relevant. There are one or two features that keep drawing me back to playing Bacon. One is the business has little to offer in the way of real challenges. I have a very good CV over 35 years. I have produced a piece of work that few other directors or producers would dare to trust me with. That is because they don’t know what my capabilities are. I DO. What else are you working on ? I am writing other new work. I will not say what it is just yet. I have managed to inspire others to to do more about Bacon. It simply means that my ideas are good. And I strive to keep moving forward. The next show I do will be ready when I am ready to do it. There is no rush. This one keeps me on my toes the joy I get from my audience truly makes me happy. We have one reviewer at this year’s Fringe – a first time for us. Gavin Lind is based in Australia and will be doing a bit of reviewing as well as performing in his own show. Our recommendations are based on our local contacts. We also see plenty of work at the Edinburgh and Adelaide Fringe Festivals. We’ll be adding to this page throughout the Fringe. If you are performing at the Fringe do send us your news to gubbins@fringereview.co.uk or send us an interview.